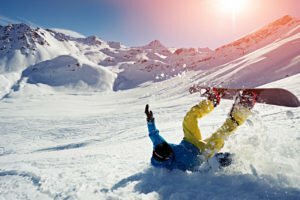 Were You Injured at a Resort in a Ski or Snowboard Accident? 1 Were You Injured at a Resort in a Ski or Snowboard Accident? 9 Have You been Hurt and Want Answers? When skiers collide, typically the skier or snowboarder who is uphill is at fault because the rule at most resorts is that the uphill skier has a duty of reasonable care to the skiers who are below. All skiers are expected to be cautious on the slopes which include looking uphill before joining the path, skiing paths that are within your ability, and always maintaining control. If you fail to look or maintain control, you may be responsible for the injuries and damage you cause. There are legal standards that govern the operation of a ski lift yet, equipment failures happen, sometimes with catastrophic results. Determining liability can be difficult as the skier has responsibilities for safety also. Typically, accidents that occur while a person is loading and or unloading from the lift are caused by inadequate ramps, poor snow maintenance, life operator errors, or user mistakes. Accidents that occur during the ride, however, are typically caused by poor maintenance, life operator inexperience, or equipment failures or design and manufacturing defects. The laws in most states will allow an ‘assumption of risk’ defense because of the inherent risks of skiing and snowboarding. But that does not mean the resort is absolved of all responsibilities. For example, a snow machine parked along an active slope, poorly maintained or improperly marked trails, or even in-area avalanches are not inherent risks of the sport, so in many states, accidents arising from these types of situations would not generally be covered under the assumption of risk. Resorts typically include a waiver in their day and season passes that can make a liability claim more difficult, however not all waivers are enforceable depending on the state laws for that resort. The most common ski equipment failure injuries involve the ski boot release bindings that are supposed to release in certain situations, such as a fall or collision, to reduce injuries. These bindings connect the ski to your ski boot and come in different types and styles depending on the type of skiing you’re doing. Other accident injuries may be caused by goggles, poles, and even underpadded helmets. ACL and MCL Injuries – where the knee is twisted beyond the normal range of movement, causing the joint to give way and tendons to tear. Shoulder Dislocations – when the skier lands on the shoulder or lands with their arms outstretched. Broken Collarbones – caused by impacts with skiers and fixed objects, and hard falls, especially with arms outstretched. Skier’s Thumb – occurs when a skier falls while holding a pole which can tear the tendons. Head injuries – mostly caused by high-speed impacts with people or objects. Some head injuries can occur simply by falling, as happened several years ago to actress Natasha Richardson.Many of these injuries will result in significant medical expenses and may require the victim to use assistive devices or make special modifications to accommodate their needs. The injured and their families may face even more financial hardship if they have to miss work. 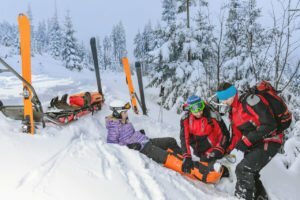 Most states require that individuals who are involved in a ski accident stop immediately and offer aid and assistance. If you are able, collect the names and contact information of all witnesses, and the name, address, and identification of those involved. Take pictures of the accident scene if you can, and detail your injuries and the injuries of others who may have been involved. The more information you can collect at the scene, the better. This is because, in some states, ski patrol and the resort have no obligation to collect information or verify identification for you or to even investigate your accident. Recently, an expert skier was hit by a snowboarder at a Colorado resort and was forced to hire a private investigator to try to find out who the snowboarder was because the resort failed to collect accurate information. Serious ski lift accidents, such as brake failures and derailments must be reported to state officials for investigations. Resort management will also conduct investigations and build an in-depth report that contains the accident details, location, cause(s) of the accident, and events leading up to the accident. 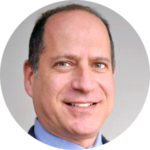 Unfortunately, your attorney will probably have to request a subpoena for the entire report because most resorts will delay giving you the report for an injury claim. In fact, if you suffered a lift injury because of the lift operator, a defective lift, or because the resort failed to properly maintain the lift or ramps you may be surprised at how strongly the resort defends itself. Resorts have a responsibility to their patrons to make sure their property is maintained properly and is safe from hazards and risks. On the slopes, this can mean making sure fence and sign posts have bumpers, that the snow maker is never in a position where someone could slam into it, and to make sure rental equipment and chairlifts are safe and in proper working order. It can also mean ensuring that paths are adequately marked for skill levels and as free as possible of hazards and dangers. If they fail to uphold this responsibility, they may be liable for injuries sustained because of their negligence. Be aware that state laws vary in how they define the “threshold” of when negligence surpasses the risks assumed by the skier or snowboarder. This means that a skier who breaks their leg when they collided with an unpadded post could be eligible to seek compensation in one state but not in another. Have You been Hurt and Want Answers? Whether you are a beginner or you have been skiing or boarding for years, accidents happen. If you or a loved one is injured on the slopes at a resort, you need a firm that is deeply versed in this type of personal injury. We know that the laws that govern ski resort liability vary greatly by state and our experience in these accident injuries has been gained by helping those injured in resorts across the country. Whether you were injured on a lift, in a collision, because of shoddy equipment, or even an avalanche, you have rights. 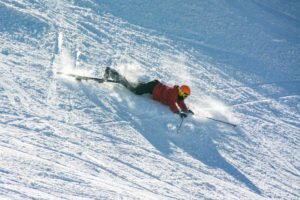 Let us help you decipher these complicated ski injury laws, so you can protect your rights and explore your options. Contact us today to learn if you are eligible for ski injury compensation.